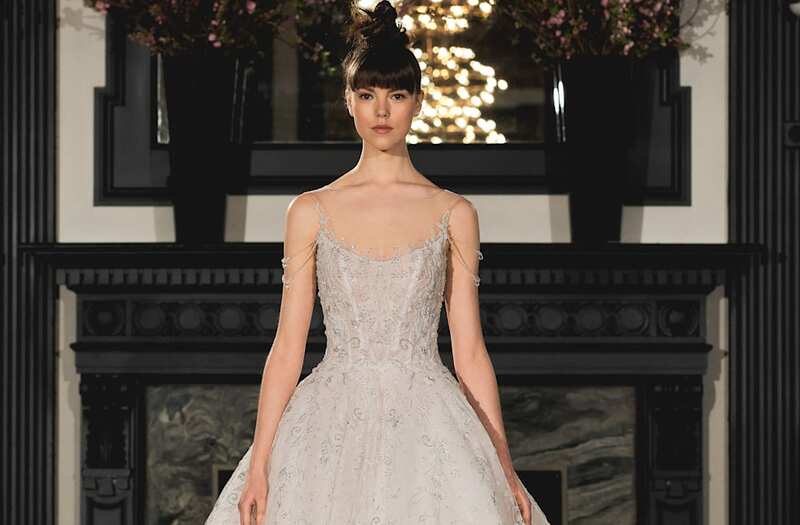 Ines Di Santo is a force to be reckoned with in the bridal world. The designer has shown time and time again that timelessness and the classic beauty of the bridal world can have a contemporary spin. And her Spring 2019 bridal collection proves just that. Aptly deemed "Modern Romance," the new line combines different mediums, such as sheaths, embellished jewels, lace and capes. The Argentinian creative also dabbled in varying hues for her new collection, touching upon light grays, ivories and creams. Trends set by Santo's 20-piece line included dramatic sleeves, ball gowns with sheer linings and sartorial illusions. Santo's new collection set the bar high for the bridal market, proving timeless elegance and femininity deserve a modern twist. Princess Diana's wedding gown was right out of a fairy tale with the exception of the perfume she spilled on her gown moments before she was to walk down the aisle. Make-up artist Barbara Daly dished that when the then-20-year-old went to dab some of her favorite scent, Quelques Fleursher, on her wrist she accidentally doused part of her gown with it, as reported by Express.co.uk.com. The result? While Diana may have looked like she was lifting her dress as to not trample it as she walked, she was actually covering the perfume spot with her hand. There are even photos from that day that capture her holding the fabric as she approaches the altar. Wedding day jitters can happen to anyone—even the future Princess of Wales. Standing in front of the altar in St. Paul's Cathedral in front of all those people seems like more than enough reason for why Diana confused Prince Charles' name, referring to him as "Philip Charles" instead of "Charles Philip." It took 15 fittings to get Diana's dress to fit for the big day. In the end, her designers, Elizabeth and David Emanuel, said they had to sew her into the dress due to her drastic weight loss since her initial fitting. Diana had dropped from having a 29-inch waist to a tiny 23.5-inch one. "Every time she turned up for a fitting, she had lost more weight," noted Elizabeth Emmanuel to Express.co.uk. "We put it down to nerves. But it did make it incredibly difficult for us to get on with making the dress. We had to keep taking the bodice in and changing the pattern. The last thing we wanted was to make it up in silk, then have to play around with that." The lace on Diana's dress was not just old—it was really, really old. Sourced from antique scraps bought at auction by her dress designers, Doyouremember.com says fabric experts identified it as Carrickmacross lace from the bodice of a gown of yesteryear—all the ways back to Queen Mary's day. Although old lace might not be your fashion go to, check out these go-to fashion tips from Princess Di. A secret romantic gesture was hidden beneath Diana's handcrafted wedding shoes. Since the top of the shoe had an elaborate heart, it seems fitting that on the sole, Diana had a custom "C" and "D" painted by shoemaker Clive Shilton. Business Insider reported that Shilton said, "No one even saw the bottom of the shoes, but it was important to us that they looked fantastic. You would have seen much more of them if she'd tripped!" The wedding train of Diana's gown was 25 feet long... that's a lot of taffeta! According to Doyouremember.com, that gave the designers a huge challenge. How was the soon-to-be princess going to climb in out of cars and carriages without getting it all messed up? Although they did their best to ensure the fabric would fold well, in the end, the taffeta couldn't avoid becoming crushed and wrinkled. There were a whopping 27 wedding cakes to celebrate Charles and Diana's nuptials, but it was the 5-foot tall cake created by the Naval Armed Forces that Charles sliced with a ceremonial sword. Besides the usual icing, Brides.com reports that the cake was decorated with Prince Charle's coat of arms, the Spencer family crest, the initials "C" and "D," and topped off with flowers including roses, lilies of the valley, and orchids. Check out the one type of cake every royal has served at their wedding. Diana was surrounded by a select group of bridesmaids that were far from the usual bridal party made up of high school chums and cousins. Brides.com reports they included the Winston Churchill's great-granddaughter; Charles' goddaughter India Hicks; Charles' racehorse trainer's daughter; and the daughter of close friends of the prince. Fashion editor Suzy Menkes wrote in The Times that they looked like "they could have been plucked from a Victorian child's scrapbook," with the girls carrying baskets of the yellow roses and wildflowers that coordinated with the yellow sashes of their dresses. Besides the wedding party always being made up of children, here are some other royal wedding rules all royals must follow. When Diana broke tradition by not including "obey" in her wedding vows, she and Charles became the first British royal couple to ditch the antiquated instruction, according to History.com. However, Diana didn't vary that much from tradition promising to "love him, comfort him, honor and keep him in sickness and health," says Brides.com. But here's another tradition that may be broken when Prince Harry and his bride-to-be walk down the aisle. Before Diana and Charles got hitched in 1981, a British citizen hadn't married an heir to the throne since 1660, says History.com. This 1660 bride was a true commoner, albeit one with a scandalous secret. A former maid of honor, Anne Hyde, ended up marrying the future King James II because she was seven months pregnant with his child. Sadly, Anne would never become queen, dying in her 30s. However, she wasn't to be the last commoner—far from it. Prince William's beloved, the now Duchess of Cambridge, Kate Middleton, was a commoner as well. And his brother, Prince Harry, will be following along when he ties the knot with commoner Meghan Markle in May. It's tradition. You recite your wedding vows and seal your love with a kiss. Perhaps, foreshadowing future angst, History.com reminds us that Prince Charles plumb out forgot the momentous kiss to seal the deal with his new bride. To make up for it the bride and groom smooched on a balcony outside Buckingham Palace for all to see, starting a new tradition that the Duke and Duchess of Cambridge emulated on their wedding day, notes ABC News. The famous sapphire engagement ring that now adorns the hand of the Duchess of Cambridge, wasn't custom-made, reports Good Housekeeping. Diana selected the white-gold diamond-encrusted ring from the Garrard jewelry collection catalog. A Look Behind The Scenes Of The Classic Western "Tombstone"